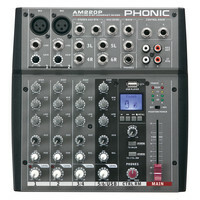 The Phonic AM220P Analog Mixer is a compact and versatile mixer with 2 balanced mic/line and 2 stereo channel inputs. This expanded version of the AM220 features USB playback for MP3 and WAV files. The pre-amps feature ultra low noise technology to ensure a professional and quality sound when used for recording. Mono channels have low-cut filters to eliminate any unwanted sounds such as stage rumble sibilance wind noise and any background noise you may encounter. With its multi-band EQ on mono channels dual multi-segment LED level meters and high volume headphone outputs; the AM220P makes monitoring and controlling a mix even easier. With its versatile function and USB capabilities this unit is ideal for home recording purposes and live use alike. For more information on the AM series please refer to the PDF below. This entry was posted in Phonic and tagged PA-DJ-and-Lighting. Bookmark the permalink.